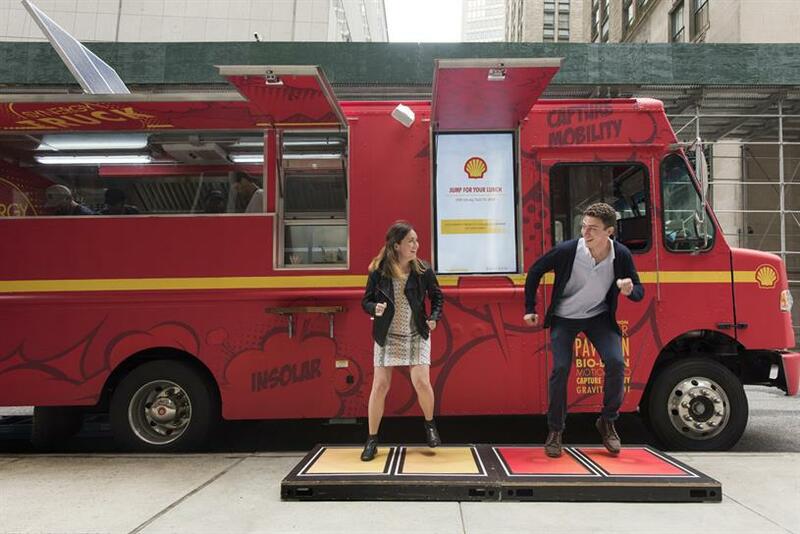 Shell is sending a food truck around New York which converts the power of footsteps (or jumping) into payment as part of its "#makethefuture" campaign. The Shell Synergy Truck’s kinetic tile walkway is one of six new energy technologies that enable the truck to take power from customers or the natural world around it to fuel its kitchen – from wind and solar capture, to recycled waste from coffee and cooking oil. The truck is a three-day pop up in New York City this week and will complete a bi-coastal tour of US colleges, before two of the trucks are handed to social enterprises at the end of the year. The "#makethefuture" global energy relay is a campaign that puts the bright energy ideas of the six entrepreneurs it supports into action in communities that need greater access to cleaner energy. The relay launched in 2016 with the ‘Best Day of My Life’ music video. The Synergy Truck initiative started with hackathons in Palo Alto and London, where engineering students from across the US and Europe were challenged to re-imagine every aspect of the food truck experience, from lighting to waste management. LA celebrity chef Ludo Lefebvre mentored the students and created the menu for the truck’s US launch. "The size and complexity of the world’s energy challenge demands collaboration between and among businesses, entrepreneurs, governments, communities and citizens – it is the key to unlocking more and cleaner energy solutions," Malena Cutuli, global head of integrated brand communications and capability at Shell, said. Food trucks are now a staple of city streets around the world and will engage people in a way that's "real and exciting", Lefebvre said. "What better way to get people engaged in the global energy challenge than by tapping into a universal passion – food." Shell "#makethefuture" agencies – J Walter Thompson London, Edelman, MediaCom, and Picnic – have created an integrated global campaign for the Shell Synergy Truck that includes experiential, social, PR, and media and social enterprise partnerships. What's spooking the ad industry this Halloween?